Rick Riordan (www.rickriordan.com) is the author of the # 1 New York Times best-selling The Heroes of Olympus, Book One: The Lost Hero; The Heroes of Olympus, Book Two: The Son of Neptune; The Heroes of Olympus, Book Three: The Mark of Athena; The Heroes of Olympus, Book Four: The House of Hades; the #1 New York Times best-selling Kane Chronicles; and the five books in the #1 New York Times best-selling Percy Jackson and the Olympians series. His previous novels for adults include the hugely popular Tres Navarre series, winner of the top three awards in the mystery genre. He lives in Boston, Massachusetts with his wife and two sons. 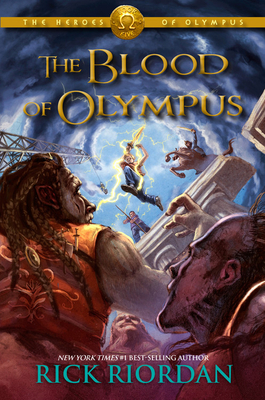 "Readers longing for a return to Camp Half-Blood will get their wish.... ...the action scenes come frequently as the three heroic teens fight monstrous enemies in North American locales..... Flashes of humor lighten the mood at times, but a tone of urgency and imminent danger seems as integral to this series as the last. With appealing new characters within a familiar framework, this spin-off will satisfy the demand for more."